We all agree that there is never enough Hallowe’en to go around, right? This is fixed with Valentwe’en, a new holiday that mashes together the best elements of Valentine’s Day and Hallowe’en into one new event! Go and see that dark romantic comedy with your sweetie, dress like Morticia and Gomez then go out for dinner at a French restaurant, take a romantic stroll with your love through the local haunted mansion…..bring black calla lilies and recite your favorite Valentwe’en. Don’t forget to pay homage to the holiday’s mascot, the Grim Cupid! 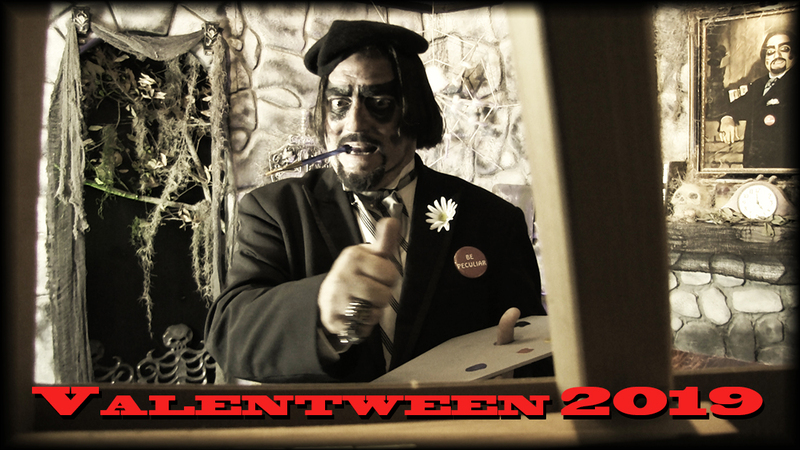 Dr. Paul Bearer hosts the 2019 Valentwe’en event, set at Art Lofts studios (10 5th Street North, above Florida Craftart). If you are an artist….submit your best Gothic Valentine for the show! To enter the art show, please contact stark_brandy@hotmail.com . Dr. Bearer will award 1st, 2nd and 3rd place to the winners. We’ll be lurking for you! I will see you there with my gothic mermaid!! !